For the casual visitor: our new travel brochure for 2017 is being posted all over the world. It will start reaching our guests’ letterboxes in the coming days, and is be available for browsing or download on our website – you can also request a printed copy. Below, we offer some impressions, comment and analysis on the travel experiences we are offering in 2017. If you are familiar with Peter Sommer Travels, you may want to read it to learn what we are up to, and if you are not, you may still want to read it to see what we are about. It is that time of year again. The 2017 brochure is hot off the press and now making its way to addresses across the planet; the travel season has come to a close and our latest trips are over: Exploring Crete ran in mid-October, and Exploring Rome later that month, both highly successfully. In fact, at just under seven months, it has been the longest active season so far, so one might think this is a time to take stock, look back at 2016 and relax a little. Not quite: we have undertaken a number of reconnaissance trips in November (you can always check what we are up to on Facebook) and we are busy planning for a bright grand new year 2017. Indeed, our new brochure is now ready – and it is one that incorporates more innovations than Peter Sommer Travels has ever offered from one year to another within in the company’s history! Starting in late 2015, we have been working very hard on implementing an ambitious programme to expand the range of travel experiences we can offer our guests, returning or new. It’s remarkable to think that we operated in just one country, Turkey, until not so many years ago, adding our first Greek itinerary in 2009 and our first Italian one a year later. In 2017, we are offering 24 scheduled tours on 16 different itineraries in six countries – and some further ones are still in preparation! A summery view of Korčula Town. In 2016, we added tours in Croatia to our programme, the fourth country where we operate, but were able to finalise it only after the year’s brochure had already been printed. Our Cruising the Dalmatian Coast: from Split to Dubrovnik (or vice versa) ran three times this year and we are intensely proud of the profound insights into that country’s fascinating historical and cultural riches that we are now able to offer. We thank our superb guides, Helena Tomas and Ivana Jevtic, for making Croatia a new focus of our itineraries and for helping us create a definitive trip in a uniquely beautiful region, including the splendid palace of Diocletian at Split, the wonderful Renaissance Town of Dubrovnik (old Ragusa), the islands of Brač, Hvar and Korčula and more. Our 2017 brochure is the first to include Croatia from the get-go and does, of course, include that cruise, one of our main new achievements in this past season. In 2017, it runs in both June and September. Looking from the Dalmatian mainland across to the distant Kornati archipelago. In 2017, we are adding two new itineraries in Croatia. Cruising the Dalmatian Coast: from Šibenik to Zadar (September) is a unique approach to a region mixing many historical strands, aiming off the beaten track and offering new insights at a leisurely pace, taking in remote islands, great old cities and wonderful seascapes in the northern part of Dalmatia. Its highlights include the perfectly preserved Medieval city of Trogir, splendid Šibenik with its cathedral, the Roman and Venetian marvels of Zadar and the remote Kornati Islands. In Southern Dalmatia, we have crafted Walking and Cruising Southern Dalmatia (September/October), offering a more active approach to the region’s mainland and islands and access to a multitude of remote sites of immense interest, including mighty fortifications, remote sacred spaces and a Greek field system that is still in use and virtually unchanged after 23 centuries! One of the most impressive archaeological sites in the world: Ephesus. In Turkey, we are running a selection of our classic cruise itineraries. Cruising to Ephesus promises first-rate sites like grandiose Ephesus, the gem that is Priene and atmospheric Miletus. Cruising the Carian Coast, taking in some of the remotest parts of the Turkish Shores, but also spectacular ancient sites like Knidos, Kaunos and Loryma, takes place in September. Our very special Gastronomic Cruise of the same region is set for late May. 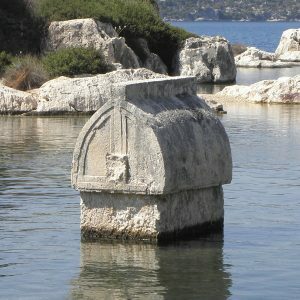 In Lycia, with its evocative and mysterious remains reflecting local Anatolian culture with added Greek and Roman elements, we offer our two-week archaeological trip, Cruising the Lycian Shore, in September, and our Walking and Cruising the Lycian Shore itinerary (also two weeks) in September/October. A famous view: Oia on Santorini. Greece is now firmly established as one of our main hubs of activity, with at least nine separate tours on six itineraries next year. In 2017, we are happy to offer our popular two-week Cruising to the Cyclades twice in May and September: Cruising to the Cyclades. Its highlights are too numerous to list: since 2016, in addition to breathtaking Santorini, archaeologically wealthy Kos and so many remote islands, it includes Delos, one of the most significant excavations in the Mediterranean. Likewise, we are running our superb two-week Cruising the Dodecanese in September/October, offering access to first-rate sites and museums in Samos, Kos, Rhodes and beyond. Another picturesque island town: Mandraki on Nisyros. Further, we have developed a fascinating new week-long cruise in the Dodecanese, from Kos to Patmos (and back), offering a leisurely and insightful approach to Kos and a series of smaller islands, such as verdant volcanic Nisyros, rugged Kalymnos and Byzantine Patmos. It runs in May/June and September, and as a Family Adventure in July. On land, we bring you our definitive two-week, with its wide scope ranging from Minoan palaces via Classical cities and Byzantine painted churches to Venetian fortified cities, its delightful range of local meals and its hand-picked choice of rural and city hotels: Exploring Crete tour. Dramatic land- and seascape in the Mani Peninsula (Peloponnese). Also in May, we are offering our new Exploring the Peloponnese (two weeks, introduced in 2016), a splendid panorama of a region so rich in myth, history and archaeology, featuring as many as six UNESCO World Heritage Sites, complemented by superb places to stay and many forays into the region’s wines and cuisine (for a recent review of the Peloponnese tour, see here). All these Greek itineraries are illustrated and described in the brochure, and we are also busy preparing some extra offerings, including a revival of our Exploring Athens, a new Walking and Cruising itinerary in the Dodecanese, and perhaps more. 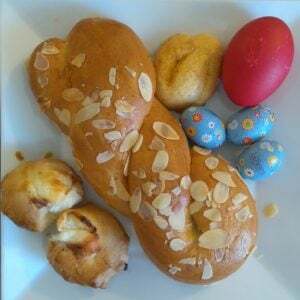 We are immensely happy to show Greece to our guests in all the detail and with all the passion that arise from our intense knowledge of the country and with the excellent local and expert guides that make our tours and cruises what they are. The pristinely well-preserved 5th century BC “Temple of Concordia” at Agrigento. In Italy, we are looking back on a great year, a success story sure to continue in 2017. The superlative Exploring Sicily tour is running twice. Taking in a unique wealth of peoples, cultures and remains, from Sikels via Greeks and Phoenicians to Romans, Byzantines, Arabs, Normans and beyond, we consider it the best-prepared tour of the Mediterranean’s largest island currently available, presenting the full diversity of Sicilian culture, tradition and cuisine. The Gastronomic Tour of Sicily, one of our most special offerings, has been redesigned and is now defined as a world-class food tour, not least due to the superb connoisseur guides we have found to present it. We are running it in late September – if you are interested in an in-depth engagement with one of Italy’s finest and most fascinating culinary traditions, look no further! Exploring Rome tour ran for the first time in 2016 to great acclaim, due to our careful preparation and to our exceptional narrator-guide, Paul Beston. We are looking forward to taking more guests on this extraordinarily rich and rewarding exploration of one of the world’s most historical cities and the highlights in its hinterland. The 2017 iteration takes place in October/November, a perfect period to explore the “Eternal City”. Our classic Cruising the Amalfi Coast, the oldest of our Italian itineraries, is also running two times, in early September and mid-September. Its well-established splendours include fabled Naples, the super-site of Pompeii and the islands of the Bay of Naples. It offers a uniquely memorable approach to one of Italy’s most famous cultural core regions. A view from Filicudi towards the Stromboli volcano in the Aeolian Islands. The new addition to Peter Sommer Travels’ Italian portfolio for 2017 is Cruising the Aeolian Islands, a wonderful week-long experience of that unusual and remote archipelago set between Sicily and the mainland of the Italian peninsula. Combining small volcanic islands, some peacefully isolated and others famously hedonistic, with off-the-beaten-track archaeological treasures and plenty of time to enjoy the clear blue waters in between, this cruise is a perfect mixture of cultural experience and the sheer pleasures offered by being on a gulet and by visiting such exquisite locations. We are thrilled to see that the June version sold out already! As a consequence, we are offering a second trip in July. The time has come: we’re eager to show you more wonderful places… The image shows the 5,000 year-old passage tomb of Knowth in Ireland. It has for a long time been our intention to grow beyond the Mediterranean, and in 2017 we are finally beginning to implement those plans. We are doing so very much on the basis of the approach we have defined and developed for our “Exploring” tours: painstaking hands-on preparation, a distinctly regional perspective, a holistic attitude to a region’s history, a desire to draw archaeology, history, art, tradition, landscape and gastronomy into a full panorama of the region, taking in superb local hotels, if possible in historical or traditional settings, and a well-informed selection of very local food and wine (and beer) experiences, all presented by guides and experts who combine profound knowledge and familiarity with a passion to communicate them. For the first time, our 2017 brochure includes itineraries in Britain and Ireland. We are thrilled to be able to offer our first two tours in the United Kingdom. One of the world’s most celebrated and most mysterious prehistoric sites: Stonehenge. Close to our Monmouth home, we have designed the superlative Exploring Wessex tour , a 7-day exploration of England’s cultural heartlands, with a dazzling range of sights, from prehistoric wonders like Avebury and Stonehenge via medieval castles and abbeys, to the serene beauties of Georgian Bath. The region may be well-travelled, but we have devised an itinerary that defines its essence like none other, combining its historical depth with a patchwork of quintessentially English landscapes, from Salisbury Plain via the rolling Cotswolds to park-like Somerset. Again, carefully chosen accommodation and the excellent produce of the area’s fertile fields and pastures round off this stunning new tour. The famous “Sycamore Gap” on Hadrian’s Wall. Our second British offer, our Exploring Hadrian’s Wall tour is a truly extraordinary 7-day trip, exploring not only that most remarkable of monuments left behind by the Roman Empire in the evocative uplands of Northumbria, but embedding it in the history of its remarkable surroundings, a historic borderland within the sceptred island that is Britain. We are immensely proud of this itinerary, which our experts will make a veritable tour de force, a narrative that brings many strands and many tales together to make a greater whole. The wonderful accommodation in a complex that goes back to a medieval castle and the region’s local specialities and traditional ales will all add to this unique experience. A place like no other: the view from the Bronze or Iron Age fort of Dún Aonghasa across Inishmore (Aran Islands). Finally (not quite), we are thrilled to present our first itinerary in Ireland. Based on profound knowledge of that country, and on passionate love for it, our 12-day Exploring Ireland tour is designed by thinking “outside the box”. It combines major highlights with off-the-beaten-track secrets, creating a panoramic view of Leinster and Connacht, Ireland’s rich eastern and rugged centre-western provinces. The sights and museums of Dublin, the venerable megaliths of Brú na Bóinne, the Celtic monasteries scattered throughout the country, but also the rich pastures of the East, the rugged limestone landscapes of the Burren and the Aran Islands and the vast boglands of Connemara will combine into a kaleidoscope of an unusually rich and complex history. The dazzling array of accommodations, mostly in old manor houses, and the delights of Ireland’s “new” gastronomy add another level of pleasure. Ireland is not just a country of extraordinary beauty and memorable hospitality, but also one of many stories – and our guides there are eager to tell them. 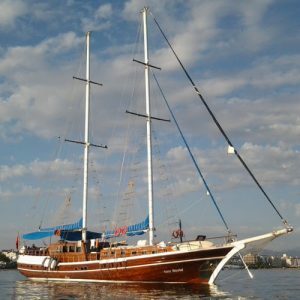 Beyond all these old and new tours, we are also ready to offer private gulet charters in Turkey, Greece, Croatia and Italy (from east to west) and to design bespoke tailor-made land tours in all the countries we currently cover: Turkey, Greece, Croatia, Italy, the United Kingdom and Ireland, in the areas covered by our scheduled tours and cruises, and beyond. If what you seek is a a very special cultural trip, led by true experts and designed just for you and your friends, family or colleagues, our tailor-made options offer you a wide range of unique once-in-a-lifetime experiences. For an introduction to our charters see here, for bespoke land tours, please contact us directly. So, if you are looking for a truly high-quality experience of the culture and history in the countries and regions we cover, whether as a first-time visitor or as a seasoned connoisseur, please have a look at our brochure (browsing, download or to request a printed copy). We would be thrilled to see you on one of our tours, and we’re happy to answer any questions you may have. So, don’t hesitate to have a good look at our new travel brochure.